I wonder how many people eat eggplant on a regular basis? It doesn’t seem to fall into our weekly dinner rotation as, say, broccoli or green beans. We like it, we do! It’s not even that exotic or hard to find, we just forget about it perhaps. And then you cook some and remark “why don’t we have this more often”? With the winter maybe coming to an end (please) and no spring in sight, I just felt like something, well, different. We loved this Chicken with White Beans and Eggplant last month. With the seasons changing we felt like something not too hearty, but not as light as this Grilled Eggplant Salad with Feta from last summer – not just yet. 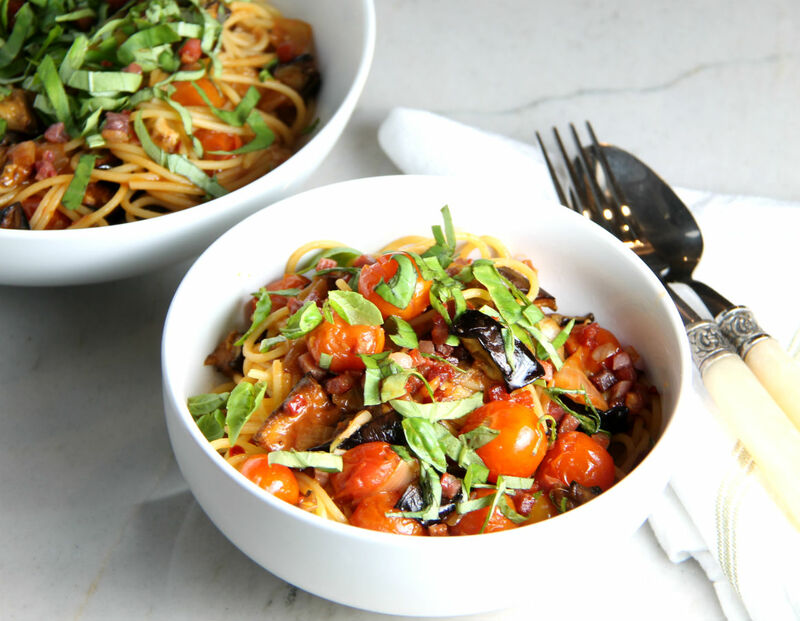 A quick pasta with eggplant and roasted cherry tomatoes seemed like a perfect compromise. We added some crisped prosciutto cubes as well, you could easily omit if you wanted to keep it vegan. Roasting the eggplant in the oven, as I do with most recipes, keeps it light and not weighed down with tons of oil, because eggplant can be a greedy sponge when it comes to oil. Line a large baking sheet with parchment paper, add eggplant and toss with 2 tablespoons of olive oil and sprinkle with salt and pepper. Slide into a preheated oven and bake 15 mins. In the meantime put the tomatoes in a medium bowl and toss with 1 tablespoon of oil and a bit of salt, add to eggplant and cook them together for another 10 mins. Put a large pot with water on to boil. Grab a large skillet and add the remaining tablespoon of oil, heat over medium heat and add the onion, cook stirring now and then for 5 mins or until onions soft but not browned yet. Add the anchovies if using, breaking them up with the back of a wooden spoon. Add garlic and cook another minute or so. Remove the pan from the oven and add to the eggplant and tomatoes to the skillet, lower heat to low and simmer together while the pasta cooks. In a small skillet cook the bacon until crisp. Reserve 1 cup of the pasta cooking water then drain pasta 2 mins short of the cooking time suggested on the package, and pour into skillet with tomatoes and eggplant, over medium heat toss well until pasta is evenly coated, adding pasta water a bit at a time, you may not need it all. Turn off the heat and add the sherry vinegar, toss again. Scoop into warmed bowls and top with the crispy bacon and basil and serve. Note: If your eggplants are large slice into 1/2 rounds first, lay in a colander and sprinkle liberally with kosher salt, let sit 15 mins, wipe off excess salt then cube and continue recipe. You will not need to add salt to it again before roasting. Smaller thin skinned eggplants tend not to be bitter, so you can skip this step.